There's been a revolution in eyecups during the last 20 years. We were surprised to find that a few manufacturers still submitted binoculars with old-fashioned eyecups. 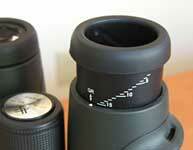 Some of the details that sort among the mid-priced binoculars are the eyecup design and quality. Our team (dominated by individuals who wear glasses) strongly preferred eyecups that twist or pull up and down, rather than the older-style rubber folding eyecups. Nearly all of the binoculars in our study did employ twist-ups or pull-ups. However, if you do not wear glasses, you might be perfectly happy with folding eyecups. The chart indicates the eyecup style for each binocular. Our team's favorite eyecups were twist-ups with multiple detents, or clicks, that allow a birder quickly to dial the degree of eyecup extension required. These are marked TC (twist/click) on the chart. The clear winner for best eyecups was the Vortex Razor. The Razor's eyecups have both detents and markings, and their extension range was better than that of any other binocular we tested. While most twist eyecups have only three detents, the Razor has 15, allowing you to fine tune a repeatable setting. The only improvement we would suggest would be to make them a wee bit stiffer to turn, to increases the solidity with which they hold their setting. Do you have the latest edition? A perennial favorite among birders, the National Geographic Guide to Birds of North America came our in a new Fifth Edition in 2006. We found many improvements over the already-good Fourth Edition. It even includes the Ivory-billed Woodpecker. It covers all the birds in North America, and the illustrations are beautiful.